Using the arch and the shield as recurring motifs, Aschely's paintings investigate notions of doubleness – entry and obstruction, patterns overlaid and intersecting, acts of veiling. Pivoting between arch/void or shield/form, the works unfold as their patterned surfaces veil, collapse and expand. Aschely graduated from the Hoffberger School of Painting, at the Maryland Institute College of Art in Baltimore, MD. Her work was featured in the 2016 New American Paintings MFA annual edition. 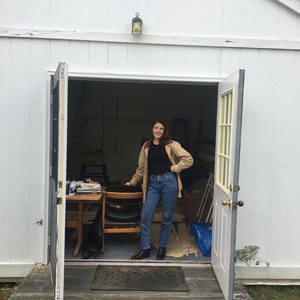 Her awards include a MICA matching scholarship for study at Skowhegan, the SMCM-MICA Artist House Teaching Fellowship, the Hamiltonian Fellowship and The Henry Walters Traveling Fellowship. She is currently represented by The Hamiltonian Gallery in Washington, D.C.